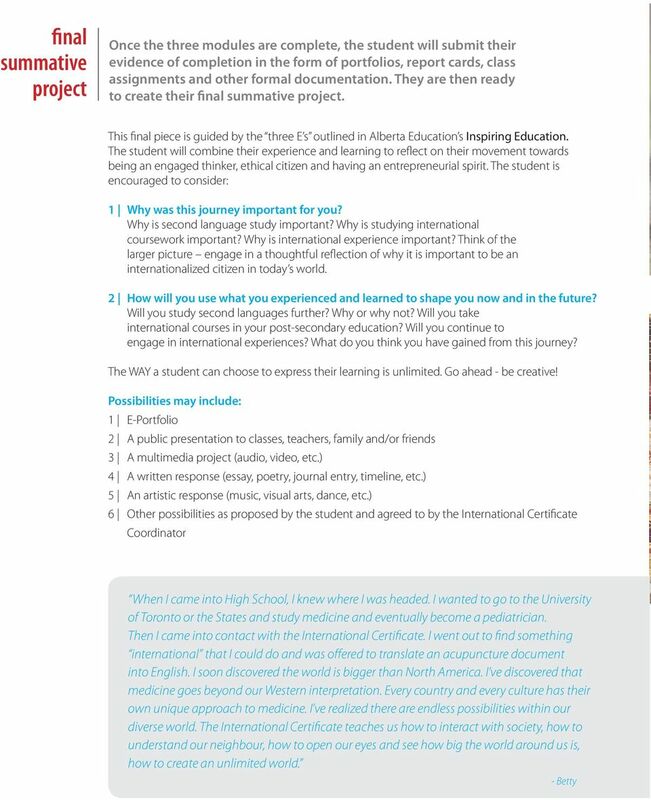 2 learning about you and your world The Calgary Board of Education s International Certificate is a way of recognizing and valuing the significant contributions, work and experiences of an international nature that students will accomplish throughout their CBE learning journey. While the rest of my class was working on essay writing, I worked with my teachers to create an integrated project that covered Math, Science, Social Studies and English. I am exploring water filtration and am creating a proposal for our Social Awareness Club to support water project in Tanzania. I wanted to know what I was talking about and to make sure we are doing the right thing. Getting grades for something I am interested in is a bonus! -Scott The vision of the transformational document Inspiring Education has summarized the three E s of education for the 21st century. 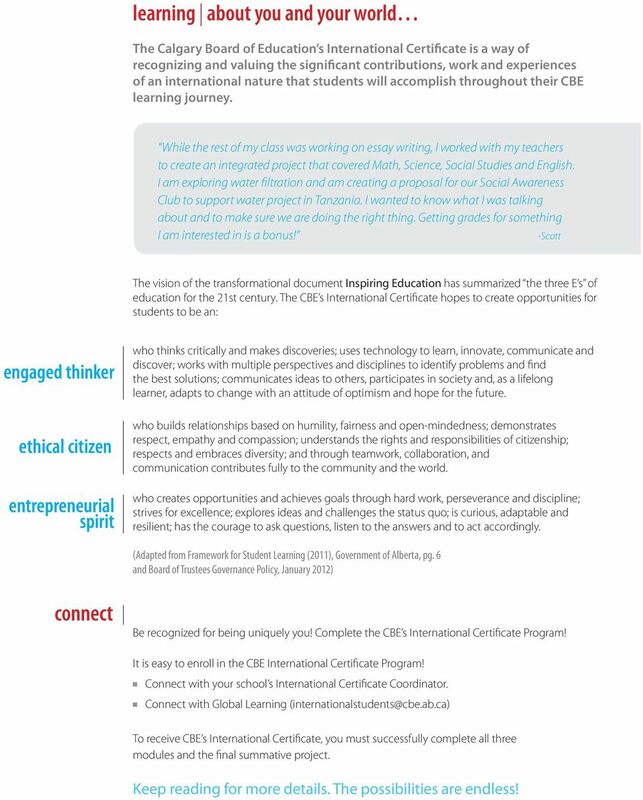 The CBE s International Certificate hopes to create opportunities for students to be an: engaged thinker ethical citizen entrepreneurial spirit who thinks critically and makes discoveries; uses technology to learn, innovate, communicate and discover; works with multiple perspectives and disciplines to identify problems and find the best solutions; communicates ideas to others, participates in society and, as a lifelong learner, adapts to change with an attitude of optimism and hope for the future. who builds relationships based on humility, fairness and open-mindedness; demonstrates respect, empathy and compassion; understands the rights and responsibilities of citizenship; respects and embraces diversity; and through teamwork, collaboration, and communication contributes fully to the community and the world. who creates opportunities and achieves goals through hard work, perseverance and discipline; strives for excellence; explores ideas and challenges the status quo; is curious, adaptable and resilient; has the courage to ask questions, listen to the answers and to act accordingly. (Adapted from Framework for Student Learning (2011), Government of Alberta, pg. 6 and Board of Trustees Governance Policy, January 2012) connect Be recognized for being uniquely you! 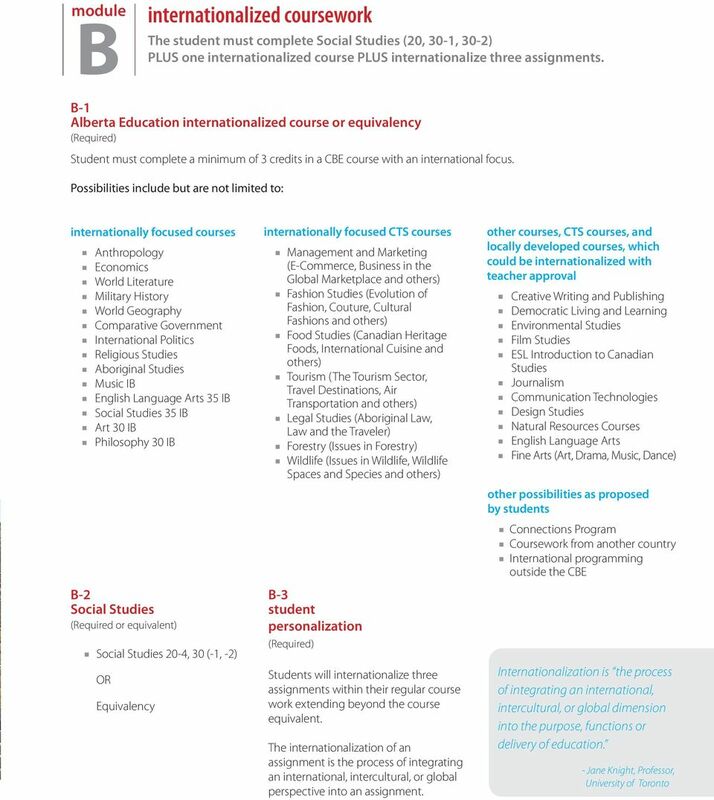 Complete the CBE s International Certificate Program! It is easy to enroll in the CBE International Certificate Program! 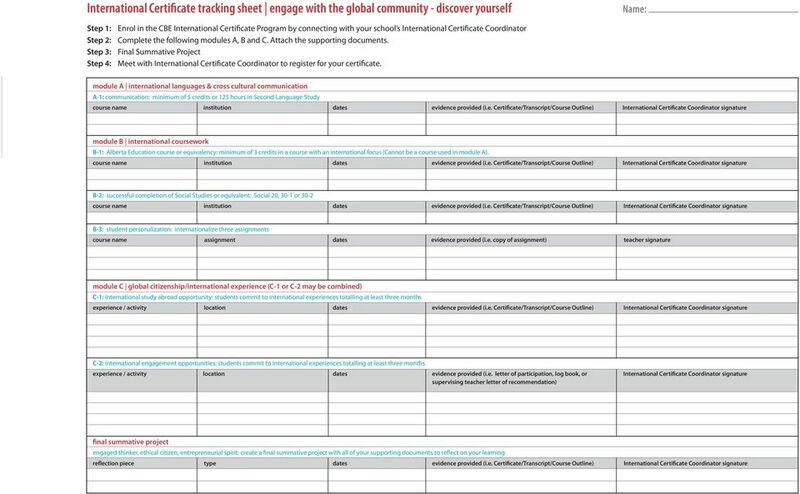 n Connect with your school s International Certificate Coordinator. n Connect with Global Learning To receive CBE s International Certificate, you must successfully complete all three modules and the final summative project. Keep reading for more details. The possibilities are endless! 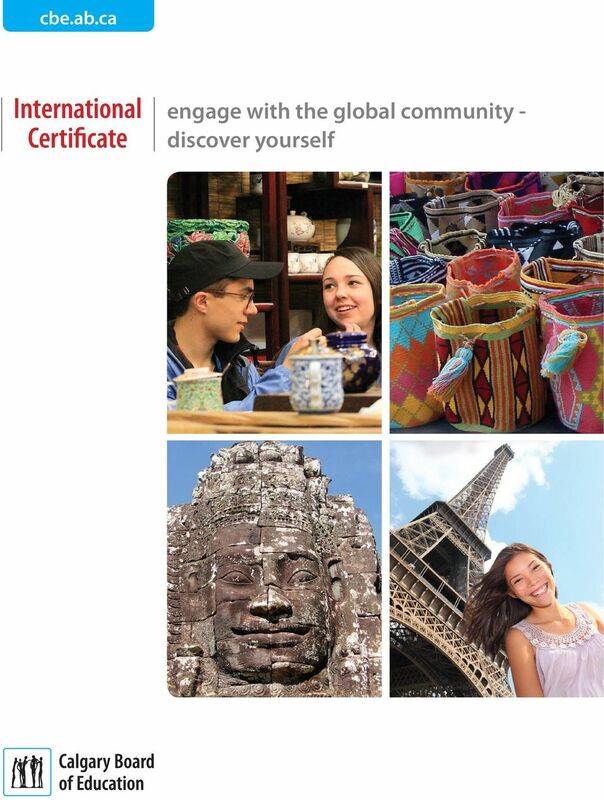 3 experience the world from your classroom and beyond - engage with the global community The modules of the International Certificate are participatory in nature, asking students to engage in their local, national, and international communities. 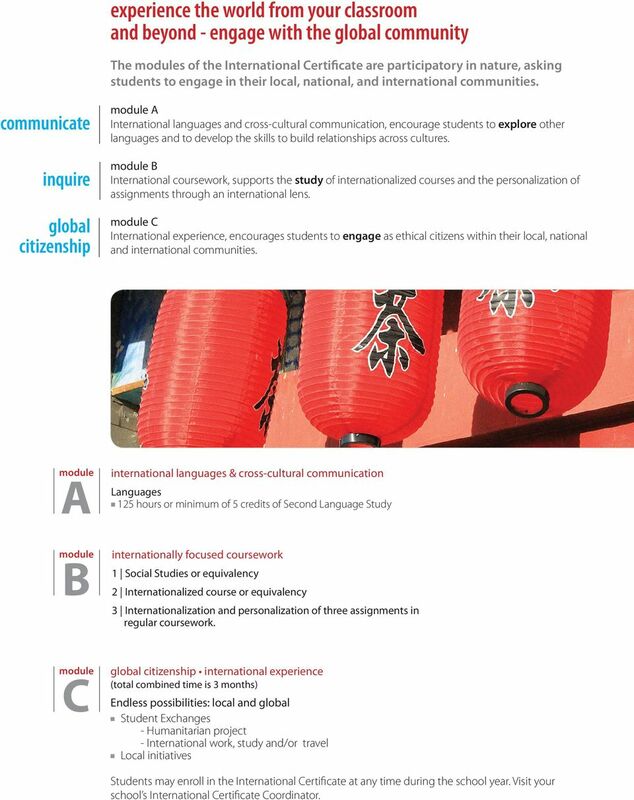 communicate inquire global citizenship module A International languages and cross-cultural communication, encourage students to explore other languages and to develop the skills to build relationships across cultures. 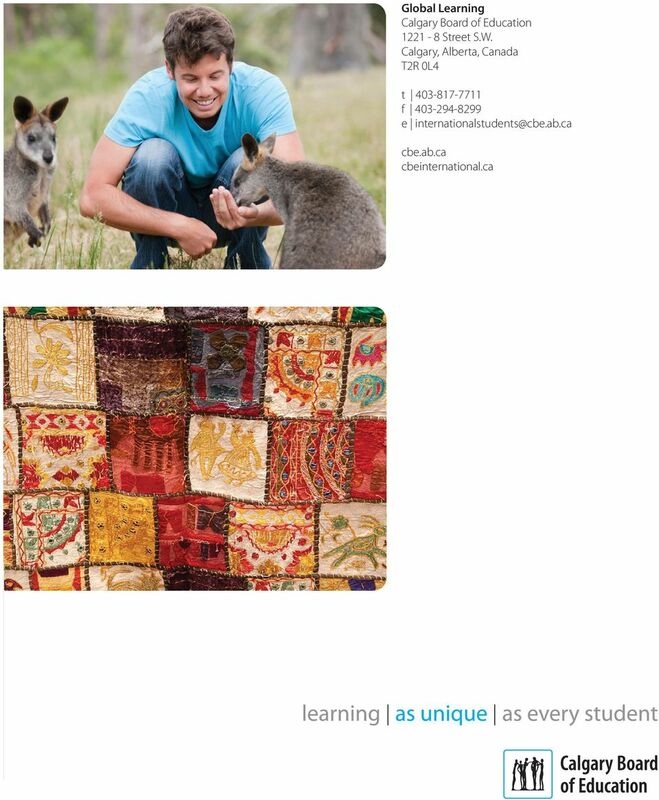 module B International coursework, supports the study of internationalized courses and the personalization of assignments through an international lens. module C International experience, encourages students to engage as ethical citizens within their local, national and international communities. 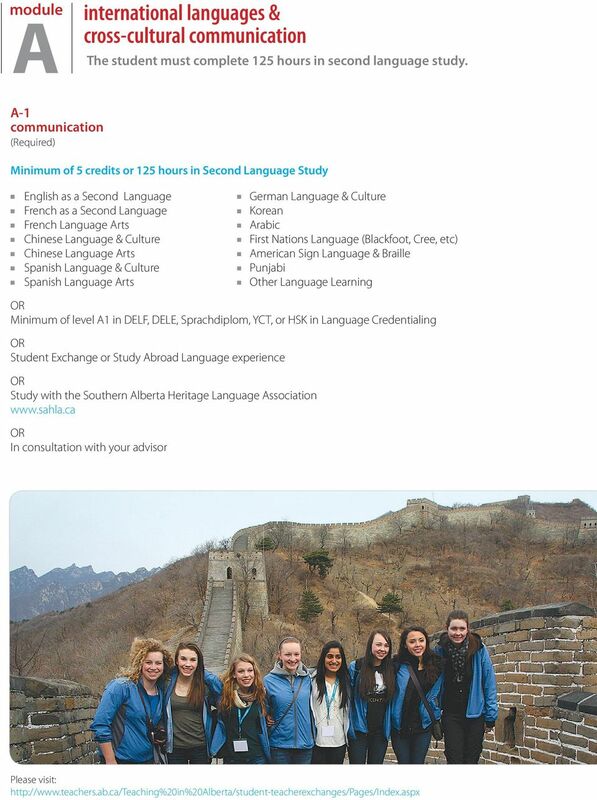 module A international languages & cross-cultural communication Languages n 125 hours or minimum of 5 credits of Second Language Study module B internationally focused coursework 1 Social Studies or equivalency 2 Internationalized course or equivalency 3 Internationalization and personalization of three assignments in regular coursework. module C global citizenship international experience (total combined time is 3 months) Endless possibilities: local and global n Student Exchanges - Humanitarian project - International work, study and/or travel n Local initiatives Students may enroll in the International Certificate at any time during the school year. Visit your school s International Certificate Coordinator. 6 module C global citizenship / international experience Over the course of completing high school, the student will have participated in at least three months of international experience. 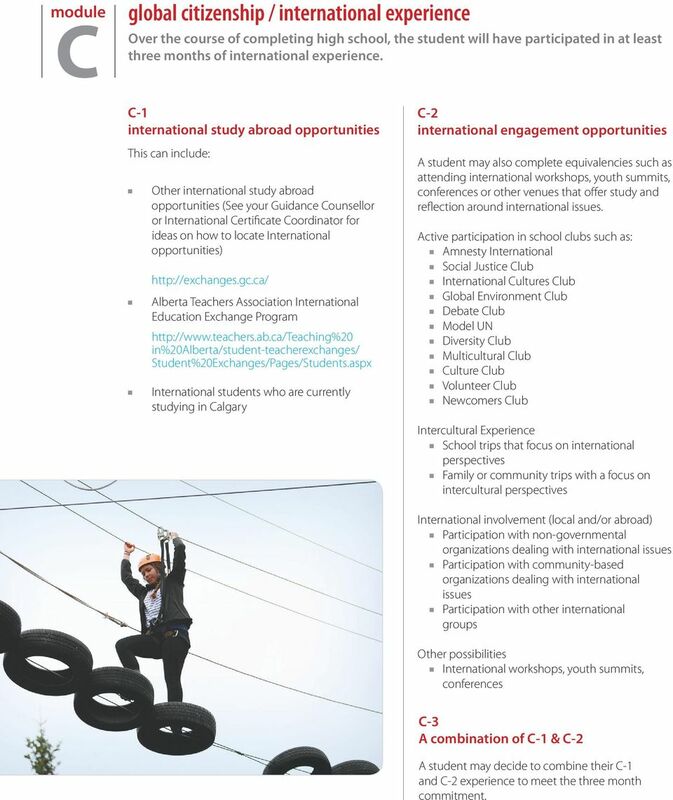 C-1 international study abroad opportunities This can include: n n n Other international study abroad opportunities (See your Guidance Counsellor or International Certificate Coordinator for ideas on how to locate International opportunities) Alberta Teachers Association International Education Exchange Program in%20alberta/student-teacherexchanges/ Student%20Exchanges/Pages/Students.aspx International students who are currently studying in Calgary C-2 international engagement opportunities A student may also complete equivalencies such as attending international workshops, youth summits, conferences or other venues that offer study and reflection around international issues. Active participation in school clubs such as: n Amnesty International n Social Justice Club n International Cultures Club n Global Environment Club n Debate Club n Model UN n Diversity Club n Multicultural Club n Culture Club n Volunteer Club n Newcomers Club Intercultural Experience n School trips that focus on international perspectives n Family or community trips with a focus on intercultural perspectives International involvement (local and/or abroad) n Participation with non-governmental organizations dealing with international issues n Participation with community-based organizations dealing with international issues n Participation with other international groups Other possibilities n International workshops, youth summits, conferences C-3 A combination of C-1 & C-2 A student may decide to combine their C-1 and C-2 experience to meet the three month commitment. Organizing My I.B. Portfolio Table of Contents The table of contents displays the order of the portfolio dividers & work samples. In what place order should the Identities & relationships divider be placed? For Learners. Canadian Language Benchmarks for Study and Work. Understanding the language proficiency levels required to work and study in Canada. For Learners Canadian Language for Study and Work Understanding the language proficiency levels required to work and study in Canada. Centre for Canadian Language For use in higher CLB level programs. Stetson University College of Arts and Sciences From its founding in 883, the College of Arts and Sciences has offered an energetic and imaginative approach to education in the liberal arts and sciences. WHAT SPECIFIC SKILLS DO GLOBALLY COMPETANT GRADUATES HAVE? Choosing a Major Assess. Explore. Experience. Transition. Understanding the Facts Choosing a college major is an important decision to make, and often times there s anxiety about making the right decision.